Irish fruit heavyweight Fyffes has agreed to be taken over by Japan’s Sumitomo in a deal that would be worth €751m (£595m) if confirmed. Fyffes – which ripens and distributes bananas, as well as pineapples, melons and mushrooms – has an annual turnover of over $1.2bn and is one of the biggest fresh produce companies in Europe. Sumitomo, meanwhile, supplies around 30 per cent of the bananas eaten in Asia, with a presence in 66 countries and a market value of $15bn (£11.9bn). It first entered the banana market in the 1960s. The Japanese firm has agreed to pay €2.23 in cash for each Fyffes share, with a total share value of $751m (£595m). This amounts to a 49 per cent premium on Fyffes' closing share price of €1.50 on 8 December. Some 27 per cent of Fyffes’ shareholders are committed to the deal, according to the company and Joshua Raymond of European brokerage house XTB believes Fyffes shareholders should be satisfied with the offer given the 49 per cent premium offered by the Japanese company. Commenting on the takeover David McCann of Fyffes said: "We believe this transaction represents a compelling proposition for our shareholders and crystallises the substantial value created in recent years through the various strategic developments and the strong operating performance of our group. 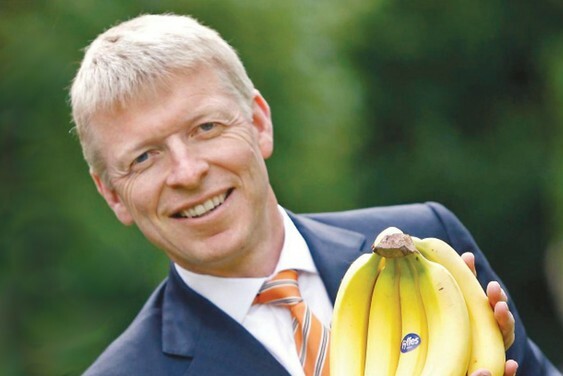 The possible buy-out follows a failed Fyffes merger with Chiquita in 2014, which McCann recently described as a “missed opportunity” in an exclusive interview with Eurofruit. But the Sumitomo takeover is "no second league deal by comparison”, said Raymond. “It puts the newly combined firm on a solid platform for future growth and margin scalability," following on from the Irish company’s own acquisitions of Canadian mushroom giants Highline Produce and All Seasons Mushrooms earlier this year for $98m (£77.6m) and $41m (£32.5m) respectively. Sumitomo’s managing executive officer Hirohiko Imura commented: "Sumitomo Corporation has long admired Fyffes for its outstanding track record and market leading position, and we are delighted that the Fyffes Directors have unanimously agreed to recommend our offer to shareholders. We believe that our offer represents a great reward for Fyffes' shareholders. “We look forward to working with the Fyffes team to further develop the business over the longer-term and to expanding into new markets to better serve customers."